I was very disappointed in this film, only 2 stars I'm afraid. 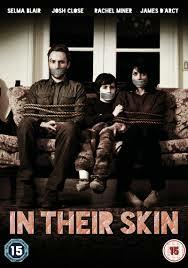 It really is a shame because the premise of In Their Skin is great and I was looking forward to watching it. The story centres around the Hughes family, Mary, Mark and Brendon, who go away to a secluded holiday cottage to get away from their everyday lives after the death of their daughter in a tragic accident. See our full review at Road Rash Reviews.